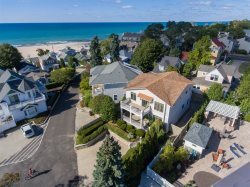 Brand new home on south side near lake Michigan beach and kids corner playground. Short walk to South Beach and Kids Corner. 90 Elkenburg. Walk to Downtown. New Construction. Summer rentals must begin or end on Sunday. This gorgeous Farmhouse Style Beach House is new construction and specifically designed as a vacation rental with all the amenities for a perfect South Haven visit. The home invites you to gather together and enjoy time with family and friends. Sawgrass of South Haven, A Farmhouse Cottage features 4 bedrooms and 3 full baths with sleeping for 12. The 2 King bedrooms each have Lake Michigan views and 1 has an En Suite bath. The main level is designed for easy open living. The super Great room includes open space with the kitchen, dining, and living spaces with large windows and great natural light. The bath has a massive shower for rinsing off on your way home from the beach. The yard is professionally landscaped with a patio for grilling and dining and a flagstone fire pit. There is also a separate guest garage space for storing your toys! The spacious front porch features comfy chairs for relaxing. Bedroom 2. Upper Level. 2 Bunks. 1 trundle. Sleeps 5. Bedroom 3. Upper Level. King. Bedroom 4. Upper Level. King. Bathroom 1. Main Level. Large Shower. Bathroom 3. Upper Level. Shower. En Suite Master. Overall, my experience with the team members was excellent... friendly, professional, there was concern for our comfort and needs and I was reassured that if we needed "anything" we could call the "after hours" team to provide for us... great customer service! Thank you SVR! Great property, highly recommended. It was perfect for our occasion, a surprise birthday party. It was open and airy, beautifully decorated, comfortable w/plenty of space... with 12 of us we didn't feel crowded... a close and nice walking distances to the beach, on a quiet tree-lined street, the landscaping was nicely appointed... everyone loved the house!Hope to come back! Sally was wonderful to work with and choose a property for us that exactly met our requirements. My husband and I stopped at the real estate office in South Haven to meet Sally and everyone there was very friendly. We had a wonderful week. The children (including our teenagers) said that it was one of our best family vacations. Thank you! using this rental company was a pleasant experience and they were easy to get in contact with before and during our stay I would definatly recommend renting thru this company in the future .I have experience with company's like vrbo and home away from home and it was a total nightmare. this house was amazing. location was great, short walk to the beach and downtown area!! I would defiantly book this property again if traveling to this area !! Everyone was great to work with. Quick response and very easy to get ahold of. We had a lovely stay at the house and would highly recommend. Everything looked as pictured or nicer. Yard was much more established, great comfortable seating and nice amenities. Home was finished very well with everything that we needed.